In our previous crypto review from last week, many of the predictions we made ended up being accurate. This week has already been very exciting for crypto markets across the board, and not just with Bitcoin. Therefore, we thought it would be a good idea to do a review once again for this week based on the setups we saw previously. In this crypto review, our focus will be on Bitcoin Cash, Dash and Litecoin. With the exception of Dash, both Bitcoin Cash and Litecoin are in the top 10 on Coinmarketcap, so they are definitely worth watching. How is the Bitcoin Cash crypto review? Bitcoin Cash has been stuck in a head and shoulders pattern since the November – December rally of 2017. A lot of the signs were negative and leaning toward a possible reversal to the downside. For one, the head and shoulder chart pattern is indicative of a trend reversal, in this case to the downside. Second, there seemed to be a great deal of selling pressure as can be demonstrated by the black trendline inclined downwards. With the formation of lower lows and lower highs, it seemed that the coin was going to keep dropping. Fortunately, the support level at $910 held against the pressure, and there now seems to be some signs of relief. After the level was tested back in February, it held up, although it was unable to break through the trendline. Now, once again, it has been tested and seems to be holding strong for now. At the support line, we can observe that several trend reversal candlestick patterns formed here including hammer and doji candles. Since then, prices have marched up to the $1,067 level where the trendline is. In our crypto review, Bitcoin Cash is now on the precipice of a breakout to either direction. A break above the trendline will confirm that the prices are about to go higher, but we need to be patient until there is a close above this level on the daily charts. Meanwhile, we also need to watch that neckline, because a break below it could also mean that prices keep dropping. What about Dash, any buying opportunities? Last week on the 15th, we also discussed Dash in detail, particularly about a potential buying opportunity. 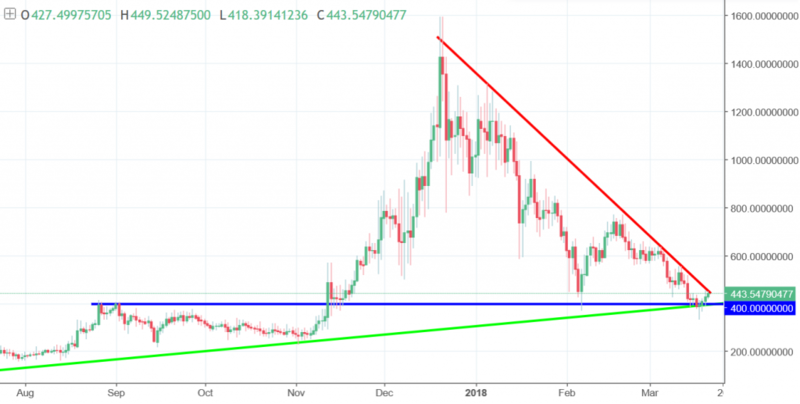 The cryptocurrency had reached a level of support around $427, where it was being braced by a level of support and an upward moving trendline. Both of these indicators showed that there was a probability of a trend reversal, hence our recommendation to buy Dash in that crypto review. As it turns out, the prediction was accurate as the horizontal support and dynamic support both held up and turned Dash prices upwards. It wasn’t smooth sailing, though, since it seemed for a moment that the support had been breached with prices going below $400. Nevertheless, prices have rallied this week to the current market price of $445. This is also the point where the downward moving trendline in red is passing, so that might be a dynamic level of resistance. 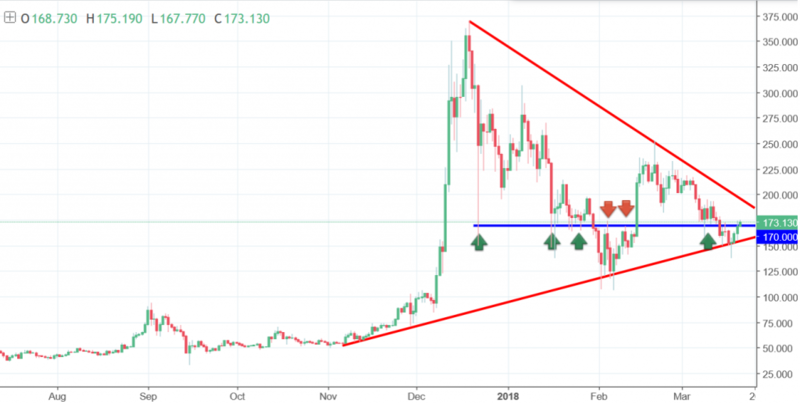 This triangle pattern is now getting squeezed, and a breakout is definitely about to happen. If the breakout occurs above the red trendline, then we should expect prices to keep rising higher. This will depend on whether today’s candle closes above this trendline as Dash has already had significant momentum already by gaining 10% in value. However, if this trendline proves too difficult to break, then the support will be tested again, with the potential for further bearish moves. 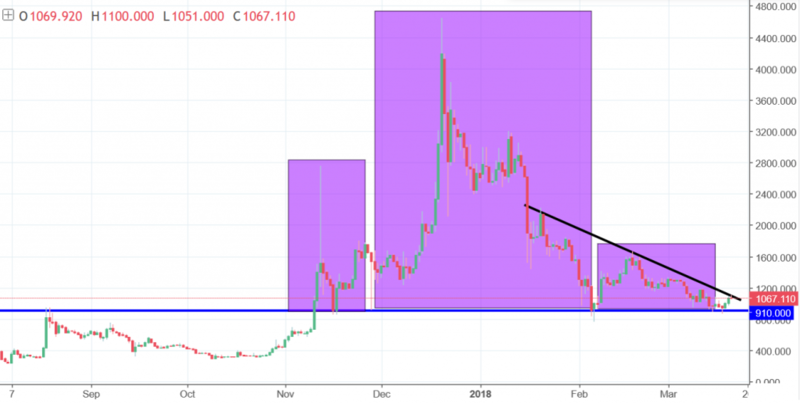 One of the great cryptocurrencies, Litecoin’s crypto review has been negative over the past two months. 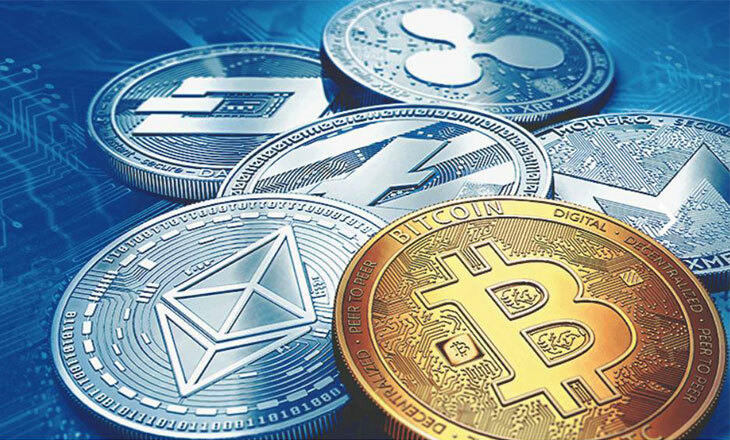 Following the slump in cryptocurrencies since January led by Bitcoin, Litecoin was the first to lead a recovery on the 14th of February. This was on the back of news about a fork and that a payments processor, LitePay, would launch in major countries like the US, UK, China and Japan. Despite the rally, the chart below shows that the prices were unable to break above the trendline in red moving downwards. Since then, out Litecoin crypto review has been negative. There was some support around the $173 level, but overwhelming bearish momentum was unable to break past it. Fortunately, the upward moving trendline was able to support prices, and there seemed to be some hope for the coin. A trend reversal was imminent as soon as a doji candle was formed on this trendline, and now even the resistance level has been broken. The short-term target is now around $200 where the upper trendline is going to pass. From then, we should either expect a breakout to the upside or another trend reversal. If there is indeed a breakout above that trendline, then prices could rally up to $225 and beyond. On the other hand, if the trend reverses once again, there could be the possibility of Litecoin prices going lower and testing the $150 region.